You’ve read the how-to parenting books, heard Hollywood moms’ visions of familial bliss, and endured kitschy mothering books’ advice to “just be happy,” yet real moms want more depth than L.A. entertainment and recycled five-step-plans to parenting perfection. Let’s face it – motherhood is hard, and it’s okay to admit that you crave quiet sometimes. You love your kids but parenting can be a struggle. That’s where WriterMom Tales comes in, offering a fresh and vulnerable take on motherhood, where life lessons are learned through story. Reading WriterMom Tales is like talking to a trusted friend, who overlooks spilled Cheerios and invites you in for coffee and shared experiences, somehow seeing the beauty in the chaos. The essays in WriterMom Tales are perfect for busy moms to savor between children’s naps, carpools, and exhaustion. 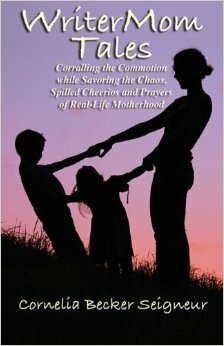 They deliver wisdom, faith, and humor while affirming the adventure and gift called motherhood. – Melanie Dobson, former corporate publicity manager for Focus on the Family, and author of Love Finds You in Homestead, Iowa and The Silent Order.